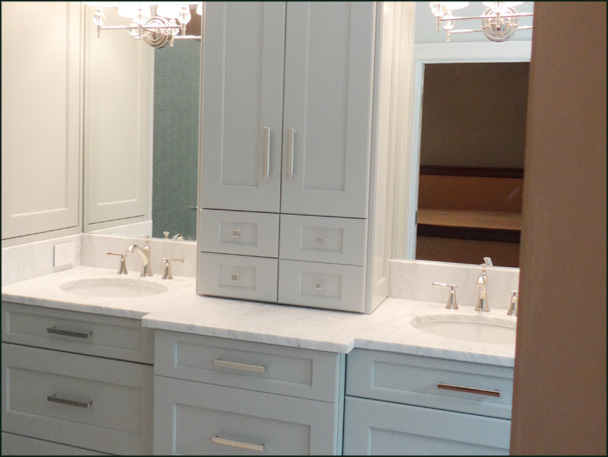 What is important to you in new bathroom cabinetry? Let us help navigate the available options based on your bathroom location and budget available. We can organize your master bath for your lifestyle and priorities utilizing our many custom options. Should it be spa like and relaxing? Is your new master bath distressed old world charm or a fresh paint color with luxury custom inserts for hair, jewelry and makeup? Is your space limited and we need to capture secret storage in walls behind panels? Whatever your need we can create a winning plan. Need to refashion the tiny powder room, maybe you want to have some fun and make it unique. Guest bathroom that gets used once a … let’s look at value engineered! During our no obligation consultation we can go over the many door styles, finishes and wood species available. Our Charlotte, North Carolina area custom cabinetry shops will do an excellent job meeting your expectations, per specifications of design, with on time delivery. “My husband and I purchased a townhome as full time residence that was built for vacation living with limited bathroom and closet space in Seabrook, SC. We had a very long wish list and the team at Impact Design Resources made it all happen. My husband, being a developer had very high expectations and Impact Design Resources met and exceeded all our expectations. Showroom & Office M – TH 9 to 4, Evening & weekends open by appt.